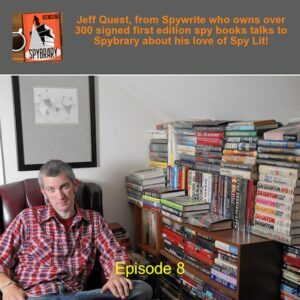 Spywrite's Jeff Quest talks to Spybrary about his favorite Spy books The name is Quest, Jeff Quest and on episode 008 of Spybrary the man behind Spywrite opens up to Spybrary's Shane Whaley about his love of spy books. Spy Write is dedicated to spy fiction and nonfiction in all forms – movies, tv and books, new and old, especially collectible signed fiction. Jeff Quest shares with us … [Read more...] about 008: Spy books with Jeff Quest.